ROOK: How Many is too Many? Pretty ugly, eh? 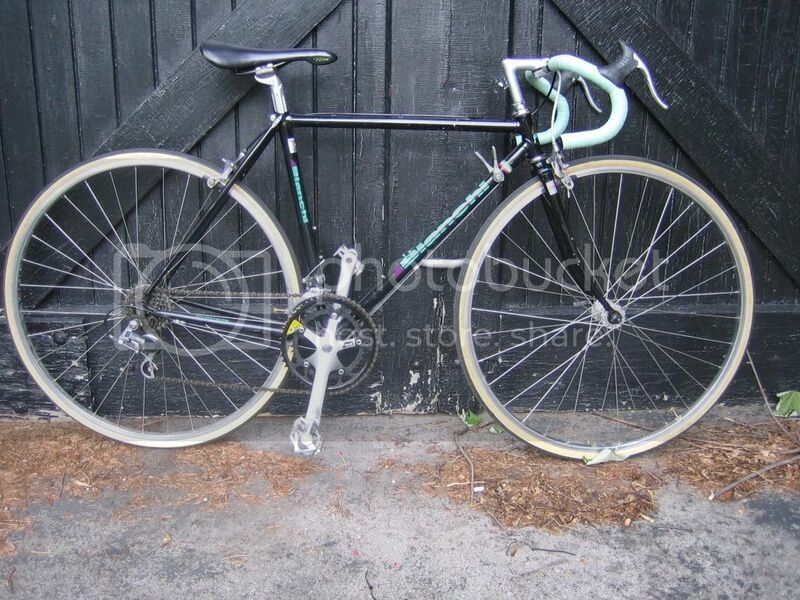 BUT it's going to be my winter commuter (my goal this winter is to ride to work and avoid parking fees!). It's a late 80s mountain bike and the nice thing is that it already has fenders. Here's the most important part though - unlike most of my other bikes, it has alloy rims so it will (should) stop in the wet. We'll see! This mixte is my practical, grocery/errand bike. It's fast-ish (for me), has a basket, and I don't feel too worried about locking it up. This is my "parade" bike and hardly sees the light of day. It now has cream tires and cork grips and is lovely! I don't like to lock it up, but it makes me happy! I dont' have a picture of it, but I also have a cheaper, CCM version of this bike that I do use and lock up more, but it isn't nearly as cute! And here's number 5 - a road bike. It was darn hard finding one in my size, but I did (and at a good price!). I dont' ride this one much either, but it's supposedly for sportier riding. I only see 4: the Kuwahara mtb, the Nishiki mixte, the Raleigh and the Bianchi. I might part with the Raleigh, if I were you. I can't see it doing anything the other couldn't. Nice fleet of bikes. Thanks for your comment! I have a vintage CCM that isn't pictured - that's probably the one I'll get rid of. I can't get rid of the RAleigh because it's my fave! LOL!